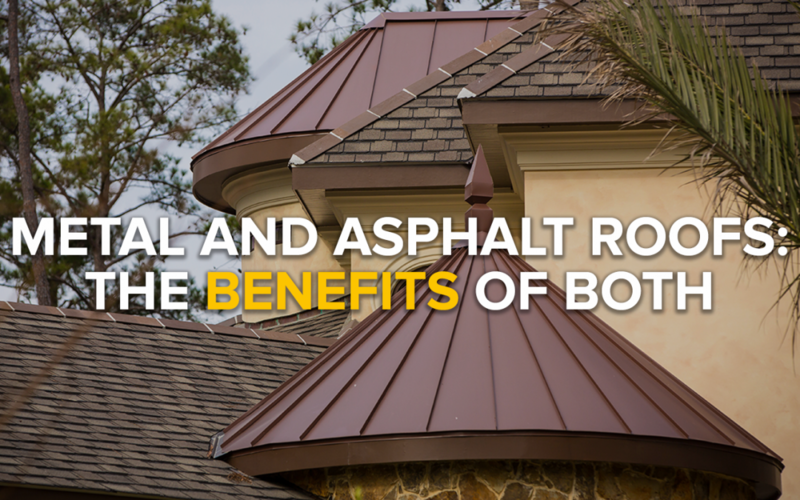 New roofs are typically the last thing homeowners think about until after a heavy rain or hail storm; however, it is arguably the most crucial part of your home, and everyone seems to have an opinion about the best roofing materials to use–traditional asphalt or metal. At the most basic level, homebuyers tend to focus on price when it comes to new roofs, builders look for functionality and practicality, and architects try to keep up with cosmetic trends. No matter who is leading the process of installing a new roof, both metal and asphalt shingles can be used to meet every standard. Asphalt is great to use for multiple reasons! Firstly, asphalt materials are easy to find, and they come in many colors, which allows for roofing customizability. Secondly, these types of roofs are quick to install and have been proven to be dependable. According to asphaltroofing.org, four out of five roofs are currently using asphalt as the primary defense against various weather conditions. Thirdly, asphalt roofs are maintainable. Replacing these types of roofs is considerably more inexpensive as compared to other materials, and they can last 20 to 30 years. Lastly, asphalt roofs are the preferred material of firefighters and first responders. Asphalt can be pulled up during an emergency, and they can be replaced during reconstruction. For new roofs, metal is a choice that is steadily growing in popularity. According to a McGraw-Hill Construction and Analytics survey, the market share for re-roofing projects has increased to 12 percent. Metal is durable, withstanding the most powerful of winds and storms while still providing customizability for homeowners. This roofing material is being used more often on newer homes for its unique ability to reduce heating and cooling costs. Metal even has the potential to reduce homeowner’s insurance rates. One of the most recognized features of new metal roofs is their extreme longevity in most environments, lasting upwards of 50 years or more before needing to be reviewed for replacement or repairs. Although metal may cost more in the beginning, homeowners who plan to stay in a house for decades can save big on reoccurring roofing costs. Whichever material you choose for your new roofing project, V & V Roofing can help in design, construction, and price. With our years of experience and professionalism, you can count on us to do a quality job the first time. Contact us today! Information gathered for this article were collected from builderonline.com and telegraphherald.com.